It’s Romney, it’s Ryan, it’s…Costanza? It is of course beyond dispute and no longer a matter of contention that the Republican Party beyond adapting as its inspiration and operational mantra one of the more cogent of our beloved George’s aphorisms: “Just remember, it’s not a lie if you believe it,” the party has taken ownership. As the living embodiment of this classic Costanzian nugget Mitt Romney and Paul Ryan deftly represent the political party flamboyantly living the lie in all things. You don’t need fact-checkers to tell you that, though they will. Yet, less convincingly, the Romney-Ryan vanilla dream team would have us believe it has embarked upon one of the most celebrated Costanzian social experiments and undergone complete conversion to the idea of (“this is my religion”) and full immersion in the project of doing “the opposite,” that is, of doing that which is contrary to all past behavior and initial instincts. For instance, saving Medicare. Republicans originally opposed enactment of the law establishing Medicare, though as a result of its ensuing overwhelming popularity grudgingly accepted it publically while relegating themselves to subterranean griping. But in the last decade or two as extreme ideologues (in the vernacular: nuts) captured and remade the Republican Party with an efficacy reminiscent of Invasion of the Body Snatchers the party lost its shyness about hating Medicare in public and openly talked of wishing its demise and even plotting it. Ryan’s initial claim to fame of course was his “bold” (the English translation of this Washingtonian descriptor would be: dumb as hell, wacky, nasty, stupefyingly idiotic) plan to end Medicare as we know it and substitute some measly vouchers. Yet, we are to believe now, that somewhat suddenly Ryan has made the Constanzian reversal, newly devoting his life to promising he will save Medicare from having as much as a hair on its head touched, Republicans no longer the inveterate and historic antagonists of Medicare and nemesis to the safety net, but their loving, devout defenders, pressing the even farther-fetched assertion that Obama and Democrats too have simultaneously converted to doing the opposite, the program’s eternal defenders and protectors suddenly eyeing it with a homicidal watering mouth. Perhaps the most astonishing Mitt and Paul as George development has been the erstwhile tribunes of the CEO class doing the exact opposite by expressing regret and remorse for declines in wages during the Obama years, their historic economic argument and surely their initial instinct being that it is anti-capitalist to the point of growing a Stalin moustache to sanction increases in wages or to raise the minimum wage or to fritter with the bottom line and endanger profitability even the slightest by paying workers more. In fact, so negative is the true, original Mitt and Paul as George disposition toward the level of workers’ wages they have opposed unions and their exertion of upward pressure upon workers’ wages with a determination normally reserved for resisting the urge to self-pleasure. 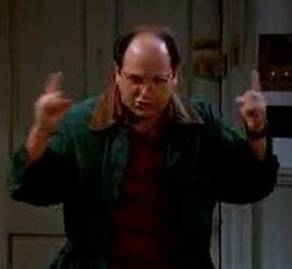 George of course was remarkably successful as the result of his diametrically changed approach. While Mitt and Paul can dissemble with the best of them as far as simple effort goes, for the sake of America we must hope America’s voters do not allow them George’s perverse success.